At the Prolific North Awards recently we promised you lots of new developments over the next few months - and the first of those arrives today in the shape of our brand new Prolific North app. Built by Apposing, it is available to download for both the iOS and Android platforms. The new app gives you an extremely convenient way to digest all the latest news and features from Prolific North, as well as our latest job postings and event news. The app also makes the process of leaving a comment very simple. 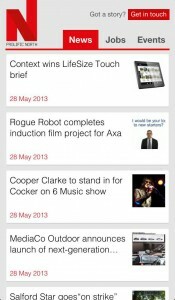 Download it today and have quick and easy access to Prolific North news on your smartphone. The iOS app can be found here and the Android app is here.